The cellulite problem is a compound problem, involving fat cells and the connective tissue that enmeshes the fat. Collagen fibers are the prime proteins forming the backbone of this mesh. Hence, the treatment of cellulite will target the fatness of the fat cells just beneath the skin as well as the health of the connective tissue enmeshing this fat. Syneron Velasmooth – FDA (U.S. Federal Drug Administration) approved. Involves infrared radiation, mechanical rollers and suction pressure. The mechanical stressors add to the thermal (heat) stress. Cynosure TriActive – FDA approved. Involves a laser and massage. Synergie AMS – FDA approved. Involves massage. Thermacool – FDA approved for off-face wrinkle reduction; presumably would help cellulite. Uses radiofrequency. Alma Accent – Newer system compared to ‘Thermacool’; uses radiofrequency. FDA approval was reported as pending. Cutera ultrasound – FDA approval reported as pending; uses ultrasound for heating. Ultrashape – FDA approval reported as pending; uses ultrasound for heating. IllumiMed Photoactive – FDA approval reported as pending; uses light emitting diode for heating. The common theme behind these approaches is causing mild heat injury to the collagen-rich connective tissue that enmeshes the fat cells immediately beneath the skin, and mechanical stressors may be added in some cases. Some before and after pictures employing these methods will help illustrate how helpful they are. Wanitphakdeedecha and Manuskiatti(2, pdf) reported reduction in thigh and abdominal girth as well as improved appearance of the back of the thighs following the use of the Velasmooth system for treating these regions (e.g., Fig 1). Sadick and Magro(3, pdf) reported reduced thigh circumference and improved skin appearance in women undergoing thigh treatment using the Velasmooth system (e.g., Fig 2). Fig 2. The outcome from 12 treatments employing the Velasmooth system spread over 6 weeks. (3) Picture 1 shows a pretreatment picture, 2 shows the outcome 4 weeks after final treatment, 3 shows the outcome 8 weeks after final treatment and 4 shows the outcome 12 weeks after final treatment. Fink et al. (4, pdf) employed intense pulsed-light treatment with a retinyl-based cream (retinyl palmitate) and reported improved skin appearance using the light-based heating treatment alone or the combination treatment (e.g., Fig 3). Vitamin A-derived retinyl compounds have been shown to improve the health and appearance of aged skin by stimulating increased collagen production. The authors reported that the addition of the retinyl palmitate cream appears to help produce a better outcome though a definitive conclusion requires more trials. Fig 3. The outcome from 12 treatments employing intense pulsed-light heating and 5-per-week topical application of retinyl palmitate, spread over 12 weeks. (4) Before (left) and after pictures of a patient shown in row 1; row 2 shows another patient. The potential side effects of these treatments include burns since heat is being employed. Retinyl-based compounds may also cause skin lightening in the applied regions, which would be a problem for dark individuals, and increase skin sensitivity to sunlight. Improved treatments can be expected in the future. For instance, drugs that inhibit collagenase (an enzyme that breaks down collagen) may be of help in combating both cellulite and skin aging, but their application for treating cellulite will be a future discussion. Alexiades-Armenakas, M., Laser and light-based treatment of cellulite, J Drugs Dermatol, 6, 83 (2007). Wanitphakdeedecha, R., and Manuskiatti, W., Treatment of cellulite with a bipolar radiofrequency, infrared heat, and pulsatile suction device: a pilot study, J Cosmet Dermatol, 5, 284 (2006). 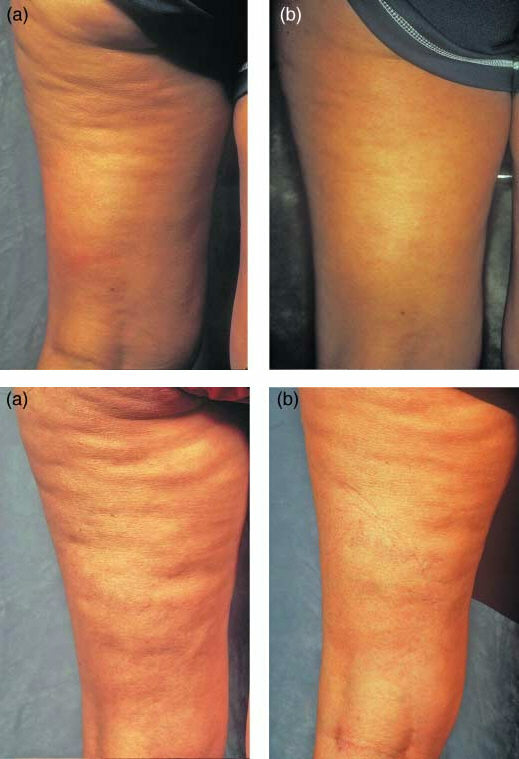 Sadick, N., and Magro, C., A study evaluating the safety and efficacy of the VelaSmooth system in the treatment of cellulite, J Cosmet Laser Ther, 9, 15 (2007). Fink, J. S., Mermelstein, H., Thomas, A., and Trow, R., Use of intense pulsed light and a retinyl-based cream as a potential treatment for cellulite: a pilot study, J Cosmet Dermatol, 5, 254 (2006). Here are the results from a pilot study on slight reduction in the girth of the thighs and abdomen, as well as improvement of cellulite, using a combination of ultrasound, suction pressure and massage (the MedSculpt device). Abstract – Liposuction is the gold standard of body contouring procedures. Many patients, however, will not tolerate the invasiveness and subsequent recovery time associated with this procedure, despite the likelihood of superior results. Consequently, patients opt for minimally invasive forms of body contouring that require several treatments, have fewer associated side effects, and afford more modest improvements. The MedSculpt device is one such modality that combines computerized massage, vacuum suction, and ultrasound with a continuous sinusoidal pulse delivered at a frequency of 3 Hz. The efficacy of this device was assessed in the reduction of thigh and abdominal circumferences. Five patients were included in this pilot study. A total of 12 treatments were performed on a semiweekly basis to 2 abdomens and 3 pairs of thighs. Photographs and circumferential measurements of each area were obtained prior to, and at the conclusion of, the treatment course. The treatments were well tolerated and without side effects. The mean reduction in thigh circumference was 2.25 cm or 4%, with a 5 cm reduction in 1 subject. Although limited improvement was seen in supraumbilical circumference, the mean reduction in infraumbilical circumference was 6.5 cm or 7.3%, with a 10 cm reduction in 1 subject. Mild improvement in skin tone, texture, and the appearance of cellulite was observed in all study participants. The results observed after 12 treatments were similar to or better than those seen with other minimally invasive, body contouring devices. Foster, K. W., Kouba, D. J., Hayes, J., Freeman, V., and Moy, R. L., Reductions in thigh and infraumbilical circumference following treatment with a novel device combining ultrasound, suction, and massage, J Drugs Dermatol, 7, 113 (2008).